The open position of the power back door can be adjusted. Open the back door and adjust it to the desired position. Press and hold the power back door switch on the back door approximately 2 seconds until a buzzer sounds 4 times. 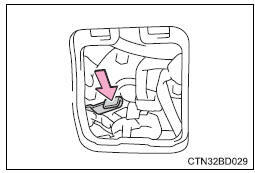 The luggage compartment light turns on when the back door or glass hatch is opened with the luggage compartment light switch on. When the engine switch is turned off, the light will go off automatically after 20 minutes. Lock the back door again as the back door will not lock automatically. The back door can be unlocked from the inside. Remove the cover on the back door trim. Use a cloth to prevent scratches. Move the lever for the back door motor. The power back door main switch is turned on and the glass hatch is closed. the engine switch is in the "on" position and the shift lever is in p.
The engine switch is in the "acc" or "lock" position. 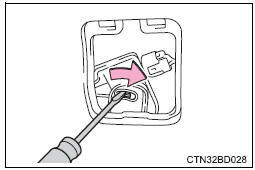 the engine switch is in ignition on mode and the shift lever is in p.
The engine switch is in accessory mode or off. In the event that the back door is left slightly open, the back door closer will automatically close it to the fully closed position. The back door closer will operate regardless of the engine switch mode. The back door can be opened while the back door closer is operating by pressing the back door opener button. A buzzer sounds and the emergency flashers flash twice to indicate that the back door is opening/closing. The back door can be opened and closed manually even when the power back door main switch is off. The back door can be opened even if it is locked. All the doors are unlocked when the power back door is operated. Make sure to lock all the doors again when you leave the vehicle. The doors will not lock automatically after the back door has been closed. If the back door is lowered manually when the back door is stopped at an open position, the back door will fully close automatically. If anything obstructs the power back door while it is closing, the back door will open slightly then stop. If anything obstructs the power back door while it is opening, the back door will immediately stop. While the power back door is opening automatically, applying excessive force to it will stop the opening operation to prevent the power back door from suddenly shutting. Press and hold the power back door switch on the back door until a buzzer sounds 4 times, pauses momentarily, and then sounds 2 times. The open position is initialized to the fully opened position. To enable the power back door to operate properly, initialize the system by completely closing the back door manually. If the battery is reconnected or a fuse is changed while the back door is closed, initializing the system is not necessary. Settings (e.G. Power back door opening angle) can be changed. make sure that the back door is fully closed. If the back door is not fully closed, it may open unexpectedly while driving and hit near-by objects or luggage in the luggage compartment may be thrown out, causing an accident. Do not allow children to play in the luggage compartment. If a child is accidentally locked in the luggage compartment, they could have heat exhaustion or other injuries. Do not allow a child to open or close the back door. Doing so may cause the back door to move unexpectedly, or cause the child's hands, head, or neck to be caught by the closing back door. Never let anyone sit in the luggage compartment. In the event of sudden braking, sudden swerving or a collision, they are susceptible to death or serious injury. Failure to do so may cause parts of the body to be caught, resulting in death or serious injury. Remove any heavy loads, such as snow and ice, from the back door before opening it. Failure to do so may cause the back door to suddenly shut again after it is opened. When opening or closing the back door, thoroughly check to make sure the surrounding area is safe. If anyone is in the vicinity, make sure they are safe and let them know that the back door is about to open or close. Use caution when opening or closing the back door in windy weather as it may move abruptly in strong wind. 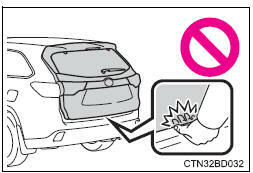 Vehicles without a power back door: the back door may suddenly shut if it is not opened fully. It is more difficult to open or close the back door on an incline than on a level surface, so beware of the back door unexpectedly opening or closing by itself. Make sure that the back door is fully open and secure before using the luggage compartment. When closing the back door, take extra care to prevent your fingers etc. From being caught. 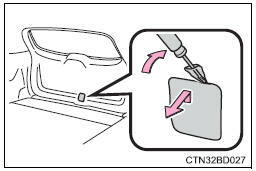 Vehicles without a power back door: when closing the back door, make sure to press it lightly on its outer surface. If the back door handle is used to fully close the back door, it may result in hands or arms being caught. Do not pull on the back door damper stay (vehicles without a power back door) or back door spindle (vehicles with a power back door) to close the back door, and do not hang on the back door damper stay (vehicles without a power back door) or back door spindle (vehicles with a power back door). 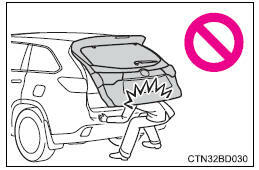 Doing so may cause hands to be caught or the back door damper stay (vehicles without a power back door) or back door spindle (vehicles with a power back door) to break, causing an accident. Vehicles without a power back door: if a bicycle carrier or similar heavy object is attached to the back door, it may suddenly shut again after being opened, causing someone's hands, head or neck to be caught and injured. When installing an accessory part to the back door, using a genuine toyota part is recommended. In the event that the back door is left slightly open, the back door closer will automatically close it to the fully closed position. It takes several seconds before the back door closer begins to operate. Be careful not to catch fingers or anything else in the back door, as this may cause bone fractures or other serious injuries. Use caution when using the back door closer as it still operates when the power back door system is canceled. Observe the following precautions when operating the power back door. Check the safety of the surrounding area to make sure there are no obstacles or anything that could cause any of your belongings to get caught. If the power back door system is turned off with the main switch while the back door is operating automatically, the automatic operation is stopped. The back door then has to be operated manually. Take extra care when on an incline, as the back door may open or close unexpectedly. If the operating conditions of the power back door are no longer met, a buzzer may sound and the back door may stop opening or closing. The back door then has to be operated manually. Take extra care when on an incline, as the back door may open or close abruptly. On an incline, the back door may suddenly shut after it opens. Make sure the back door is fully open and secure. In the following situations, the power back door may detect an abnormality and automatic operation may be stopped. In this case, the back door has to be operated manually. Take extra care when on an incline, as the back door may open or close abruptly. if a bicycle carrier or similar object is attached to the back door, the power back door may not operate, causing itself to malfunction, or the back door may move in the closing direction after being opened, causing someone's hands, head or neck to be caught and injured. 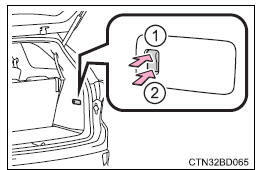 When installing an accessory part to the back door, ask your toyota dealer for details. Never use any part of your body to intentionally activate the jam protection function. The jam protection function may not work if something gets caught just before the back door fully closes. Be careful not to catch fingers or anything else. The jam protection function may not work depending on the shape of the object that is caught. Be careful not to catch fingers or anything else. The back door is equipped with damper stays that hold the back door in place. 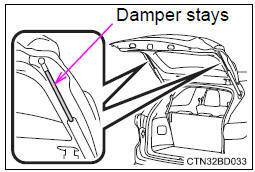 Failure to do so may cause damage to the back door damper stay, resulting in malfunction. Do not attach any foreign objects, such as stickers, plastic sheets, or adhesives to the damper stay rod. Do not touch the damper stay rod with gloves or other fabric items. 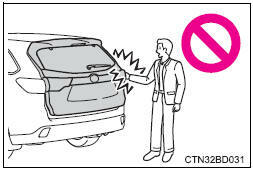 Do not attach any accessories other than genuine toyota parts to the back door. Do not place your hand on the damper stay or apply lateral forces to it. The back door is equipped with spindles that hold the back door in place. 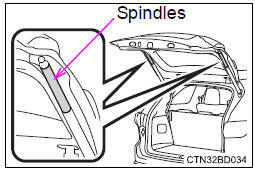 Failure to do so may cause damage to the back door spindle, resulting in malfunction. Do not attach any foreign objects, such as stickers, plastic sheets, or adhesives to the spindle rod. Do not attach any accessories to the back door. When attaching, ask your toyota dealer for details. Do not place your hand on the spindle or apply lateral forces to it. Do not apply excessive force to the back door while the back door closer is operating. make sure that there is no ice between the back door and frame that would prevent movement of the back door. Operating the power back door when excessive load is present on the back door may cause a malfunction. Do not apply excessive force to the back door while the power back door is operating. Take care not to damage the sensors (installed on the right and left edges of the power back door) with a knife or other sharp object. If the sensor is disconnected, the power back door will not close automatically.